A sixth-grade teacher hopes to encourage a positive notion for students. One middle school teacher offered a unique message for her students ahead of today’s National School Walkout. (Courtesy Jodie Katsetos) Teacher Jodie Katsetos posted this message to students at Arcadia Middle School in Oak Hall, Va., on March 14, 2018. Katsetos told ABC News she first got the idea while researching information about the national school walkout and found a positive message that resonated, which she adjusted for her own students. 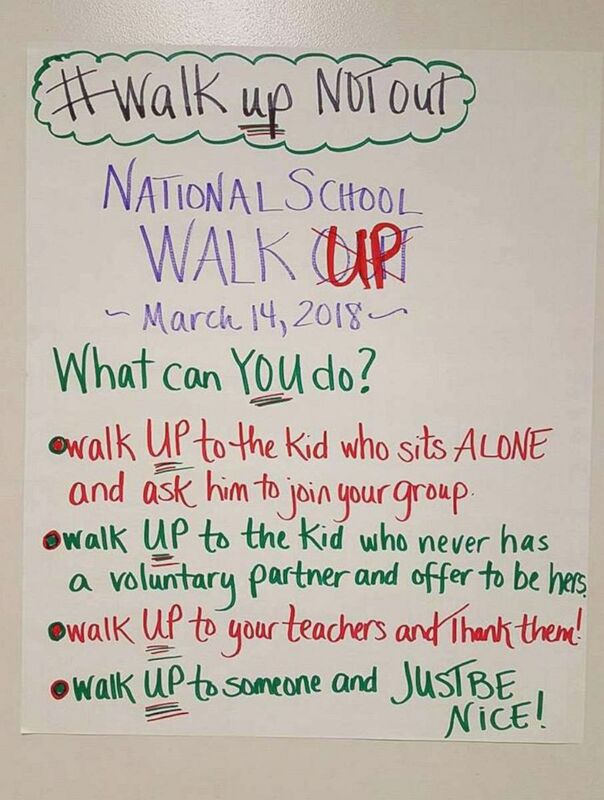 "I adapted the message to fit areas of concern in my school," Katsetos said, adding that she wants her students to be able to participate in both the walkout and the notion of the "walk up." The message lists five things students can do to promote a positive classroom environment. "I am adamant about it staying positive," she said about the dual messages of the walk out and walk up. "I'm not pushing either. I made those suggestions as alternatives to walking out and just an everyday reminder to include others and be considerate, which is something that I talk about with students each day." Katsetos first posted a photo of her walk up message on Facebook and the post has been shared more than 285K times so far. The ENOUGH nationwide walkout honors the 17 Parkland victims, one month after the shooting at Marjory Stoneman Douglas High School. More than 3,100 walkout events were registered around the country as of this morning, according to event organizers. The school’s principal Brian Tupper declined ABC News’ request for comment on Katsetos’ message. Accomack County Public Schools did not immediately respond to ABC News’ request for comment.